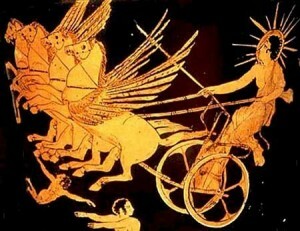 …Apollo heard his prayer. He came down furious from the summits of Olympus, with his bow and his quiver upon his shoulder, and the arrows rattled on his back with the rage that trembled within him. He sat himself down away from the ships with a face as dark as night, and his silver bow rang death as he shot his arrow in the midst of them. First he smote their mules and their hounds, but presently he aimed his shafts at the people themselves, and all day long the pyres of the dead were burning. That’s not quite how Skjærvø et al, authors of “Solar activity at birth predicted infant survival and women’s fertility in historical Norway” describe how Apollo’s arrows join war, famine, pestilence and death in ending the lives of 17th-19th century Norwegians. Skjærvø et al use church records of births and deaths from two districts in western Norway. They show that men and women born during years with high solar activity have a reduced probability of reaching adulthood and a reduced life expectancy. Further, low-status women born in years with high solar activity have a reduced fertility rate and life-time reproductive success (defined as the number of children surviving 20 years). Skjærvø et al hypothesise that changes in survival and fertility were caused by enhanced ultraviolet radiation at the solar maxima which depleted the Norwegians mother’s folic acid reserves. The link between folic acid deficiency and problems during pregnancy are well known. So far the hypothesis holds. The link between UV radiation and folic acid depletion is established, but the doses received by some of the Australian participants in the study cited by Skjærvø et al (over 600 Joules UV radiation per day), suggest they were sunbathing. 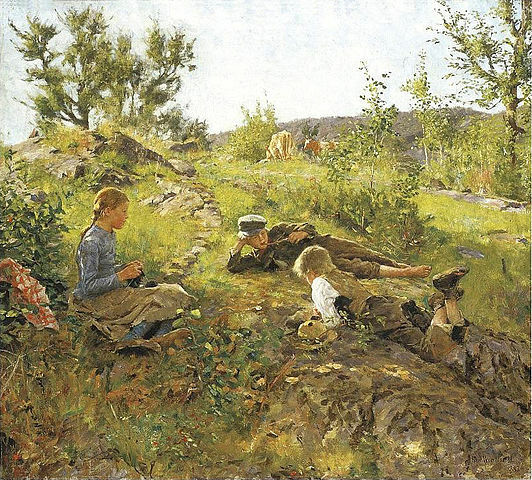 Nineteenth century Norway was not exactly a bikini culture: the doses received by the Australian sunbathers is likely to be much higher than the Norwegian mothers received. The amount of UV radiation from the Sun varies between the solar maxima and minima. Lean (1989) report that at wavelengths of 250 nm, UV insolation is 5% higher at solar maxima. At wavelengths longer than 300 nm, the irradiance is less than 1% higher. UV radiation with wavelengths shorter than 280 nm (UVC) is absorbed by the atmosphere. This means that the doses of UVA (400 – 315 nm) and UVB (315 – 280 nm) are increasing by ~1% and ~3% from solar minima to solar maxima, respectively. I don’t know what the dose response curve is for folic acid degradation, but I would be surprised if a 3% difference in UV dose caused a disproportionate amount of folic acid degradation. The Australian study, for reference, had a more than three-fold difference between the lowest and highest dose received. This 3% temporal variability can be put into context by looking at the geographical variability shown in maps provided by the EuroSun project. 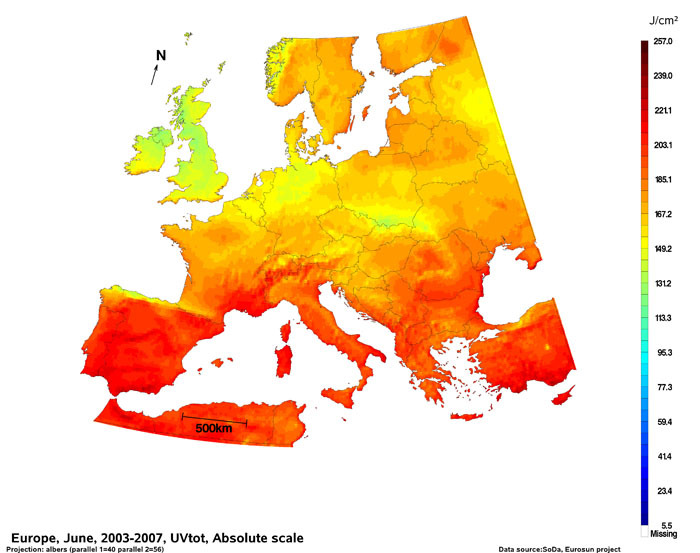 Mean June UV irradiation (2003-2007). With apologies for the rainbow scale. Just across Norway, there is a ~50% difference in June UV irradiance. If a 3% difference in UV irradiance over the sunspot cycle could cause a significant reduction in life expectancy in western Norway, life should be almost impossible on the south coast of Norway! In winter, the sun is low in the sky and UV doses are very small (and there is minimal exposed skin to be irradiated). In any case, the 3% difference in the Sun’s output of UV is small in comparison to the other determinant of UV irradiance at ground level – clouds. 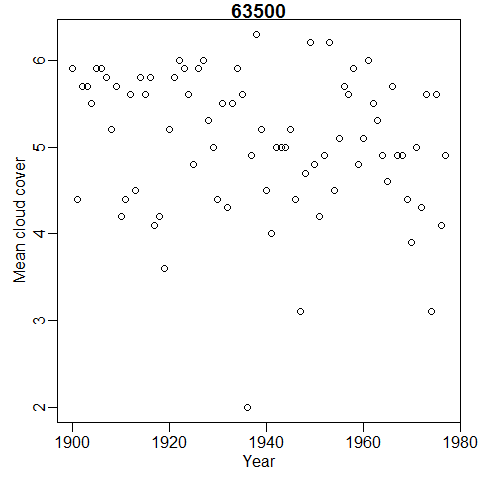 Data from the Norwegian meteorological office can give an idea of how variable cloud cover is from year to year in western Norway. Mean May-August cloud cover at Sunndal, western Norway, in octas (0-8 scale). Clouds do not stop all UV. If we assume that an overcast sky blocks 75% of the UV (Kuchinke and Nunez 1998), then there should be about 40% more UV irradiance from a sky with mean of four octas of cloud (50% cover) than one with six octas. Year-on-year variability in UV irradiation due to cloud cover is about an order of magnitude larger than that due to solar variability. Given the above, I am convinced that the mechanism proposed by Skjærvø et al is not plausible. I doubt any UV-based mechanism is plausible, and the relationship between the sunspot cycle and weather seems to be so weak that any weather mediated mechanism is also unlikely. I have two suggestions. The first is that some property of the data causes the statistical methods (which look good) to fail unexpectedly. The second is chance – one of the 5% of results that appear to be statistically significant at the p = 0.05 level when the null hypothesis is true. This is yet another study of the impact of solar variability on palaeoecological data that I do not find credible. This entry was posted in Peer reviewed literature, solar variability and tagged Skjærvø et al (2015), UV radiation. Bookmark the permalink. This may be problematic: “we categorized all children born between 1800 and 1825 as part of the solar minimum period”, so there are more SSmin years from later in their period of study (1676-1878) than early in it. Population growth probably means that there are more individuals from later years than earlier ones, so the SSmin data comes more from the 19th than the 18th century and the SSmax data is temporally biassed the other way. But I can’t see how they account for any secular trend in survival, fertility and LRS because the year of birth is a random effect in their GLMM, i.e. the year is treated as a nominal variable not a number. From your irradiation map it appears that the coastal site Smøla is likely to receive less UV than the inland site Soknedal (unfortunately both sites are just off the map, but the trend is clear). Yet their results show “the inland population (Soknedal) had significantly higher LRS than the coastal population (Smøla)” which is the reverse of what ought to happen if UV is reducing LRS. Thanks for this. I was suspicious that the Dalton minima, spoiling their otherwise temporally balanced design, may be causing them problems if there were trends in survivorship, but needed to check. Missing supplementary material didn’t help. I hadn’t considered the how an increase in population over time would affect the analysis, partially because I hoped that the GLMM might be robust to this. I would expect Soknedal to have more UV. It’s at about 300 m asl, and probably gets less cloud being in the rain shadow of the coastal mountains. But some of the coastal islands also get a nice climate in front of the mountains. Colleagues at Bergen are working on UV effects on plants and have some data that I can check. Smøla is in the coastal heathlands. In this belt along the coast, fishing was an important part of the livelihood. I wonder how important drowning was as a cause of death. I’ve been playing with some dummy data. At least in my analysis, the Dalton minima doesn’t have much effect. It is too close to the mean of the data (1777) to have much leverage. The difference between the mean year for SSmin and SSmax is only a few years. It’s possible that this is one of several issues and the effects are cumulative. Episodic disease outbreaks preferentially aligning with SSmax by chance is my next guess – but I doubt they have information on cause of death. There is a known correlation between the solar cycle and weather in Europe (see Lockwood 2012). This is pretty strong and it is an obvious explanation for the observed situation. Nevertheless, random correlation is always a possibility. Solar driven climatic effects are more likely than a direct UV effect, but are still unlikely. Lockwood 2012 argue that winters are colder in solar minima. If cold winters were more difficult, this should lead to the opposite pattern to that observed, with better survival as SSmax. Thanks, as is often the case somebody has to do the real numbers to see if an effect is actually large enough to be interesting.